Listen up, laity: Hear the call to be deaconess or home missioner? After 42 years as a registered nurse working in recovery rooms and more than 20 years in ministry, you might think Mae Griner of Gainesville would be ready to kick back and relax after retirement. But she felt there was more to do. “I just knew that I was called to really be in a ministry and take my mission into the community,” Griner said. Rev. Clarke Campbell-Evans, left, Dr. Thomas Kemper of Global Ministries and Florida Bishop Ken Carter bless Mae Griner in her new ministry as deaconess. Photo by Cindy Skop. 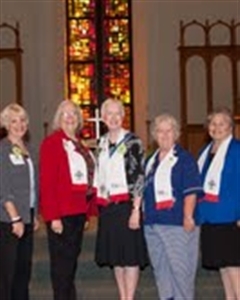 Griner was consecrated in April as a deaconess at the United Methodist Women Assembly in Louisville, Ky., thus joining the ranks of a little-known group of lay ministers who offer their professional expertise in God’s service through The United Methodist Church. 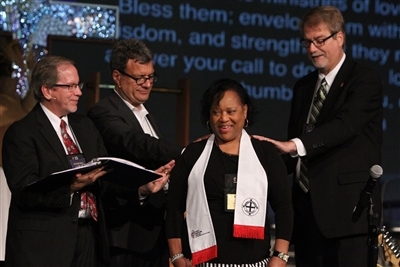 The Florida United Methodist Church recognized and celebrated her commission in front of a crowded assembly hall at The Lakeland Center during Annual Conference 2014. The new deaconess will serve as parish nurse and healthy ministry coordinator for Bartley Temple UMC, Gainesville. The program will work with body, mind and spirit and take basic free medical care into the community. Across the connection, United Methodist deaconesses and home missioners make up a diverse group of laity ages 20 and up, representing a variety of ethnic groups and professions. Those consecrated and commissioned must serve in United Methodist or related programs or in helping professions, such as health care, education, music, counseling or social work. The opportunities are wide open for non-traditional helping professionals, including a former member of the U.S. Army Corps of Engineers now working on environmental issues as a home missioner, a deaconess who is a firefighter and city council member and a home missioner contractor working with disaster relief. Griner, wife of Pleasant Plain UMC senior pastor Milford Griner, is no stranger to ministry. She credits more than 24 years of participation in United Methodist Women (UMW) at the Florida Conference level and at church for helping her develop a “strong heart for missions.” She heard about the deaconess program at the annual UMW School of Missions, now Mission u, and then attended a discernment event sponsored by the UMW national office. 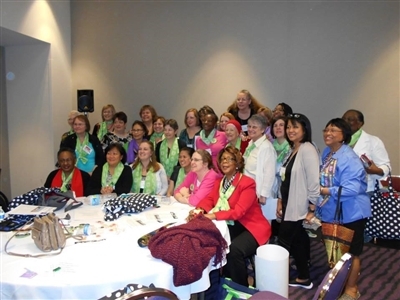 Mae Griner of Gainesville was among 26 deaconesses consecrated at the United Methodist Women Assembly in Louisville, Ky. Photo from Nan Gordon. Griner joins three other active deaconesses in the Florida Conference: Nancy Faine, in outreach ministries for First UMC, Clermont; Mary Melvin, a former school counselor in a Title I school in Tampa, currently on leave in Archer; and Nancy “Nan” Gordon, who is the musician-in-residence at Shands Hospital at the University of Florida and music program director for The Honor Center, Department of Veterans Affairs, Gainesville. “Though my ministry is one of instrumental music, my prayer is that my presence would be a sermon about loving kindness and that … being served by a United Methodist deaconess would serve as a witness to those I serve that God cares about their recovery enough to put helpers along their paths,” Gordon said. She does not receive financial compensation for her work but says being held accountable in an annual appointment review serves as a “gentle incentive” to discipline herself, be on time, keep records and work in cooperation with others. “Putting on the deaconess pin each day reminds me of my vow,” she added. Deaconesses have been a vital part of the Methodist tradition since 1888. Currently, there are approximately 168 active deaconesses nationwide. They were joined by home missionaries, primarily through the union with the United Brethren Church in 1968. That program ended in 1988, but there are still nine active home missionaries. In 2004, the position of “home missioner” was created to allow laymen to serve, and today there are 10 in full-time service nationwide. Deaconess Becky Louter, who oversees the program for UMW, said candidate applications are increasing. In the Florida Conference, 27 candidates – 24 for deaconess and three for home missioner – are working to complete the process. Pictured left to right are retired home missionary Lois Rogers Watson; deaconesses Mary Melvin, Nan Gordon and Nancy Faine; and retired deaconess Marie Rivera at the 125-year anniversary of Trinity UMC, Gainesville. Photo from Nan Gordon. Deaconesses and home missioners are approved through an extensive process that takes an average of two years but can take much longer. According to the UMW website, candidates must be called by God to full-time, mission-oriented service as part of lay diaconate and able to serve no less than 10 years. They must be UMC members and already trained or certified for the ministry in which they wish to serve. Most have a college degree; many have advanced degrees. Candidates must complete an application, provide references and, upon recommendation of a review committee, go through interviews and psychological testing. They must complete core studies the Bible, theology of mission, and UMC history, polity and doctrine. Once candidates fulfill all requirements, they are consecrated by the Office of Deaconess and Home Missioner at a national assembly or venue and then commissioned by the bishop in their home conference. If they receive a salary, it is paid through their employer. They are full voting members of their annual conference, Louter said. They are lifetime members of a fellowship of those recognized, held accountable and living out the social principals of the church. For more information on becoming a deaconess or home missioner, go to www.unitedmethodistwomen.org/dhm or call the Office of Deaconess and Home Missioner at (212) 870-3850. -- Kitty Carr Carpenter is a freelance writer based in Palm Harbor.